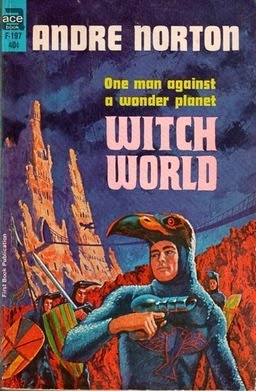 A few years ago I discovered Andre Norton's Witch World series and it's pretty good stuff. She wrote seventeen books so I still have a lot to read, but I'm really looking forward to them. Fortunately, they're all pretty short by today's standards, so they got that going for them. They really deserve to be better read than I think they are these days. I was surprised to see so few comments on Matthew David Surridge's review of the first novel at Black Gate the other day. With my review today of Three Against the Witch World and the Appendix N stuff about her books over at Tor.com maybe she'll get a little more reader love. I think the biggest problem they have is their name - Witch World. It's all a little twee. If "witch" only brings to mind Margaret Hamilton or Margaret Murray, you might not think Norton's books will be the exciting, slightly pulpy heroic fantasy (yeah, they start off sort of sword & planet, but that kind of fades away) that they are. And they really are a blast. C. J. Cherryh's introduction to the excellent Lore of the Witch World describes how every valley has something new, behind which lies something else which is linked to the deep history of the Witch World. That only hints at the depth of creation Norton brought to the series. As with so much of what I've read in S&S, I have to thank the late Lin Carter my entree to Witch World. He managed to get a new Witch World story for Flashing Swords #2, "Toads of Grimmerdale", and it's great. I don't think if I had read that first story I would be writing about her now. Dead twenty-five years and Carter's still garnering new readers for writers he loved. I wonder if there's still a place for the Witch World books in this day and age. 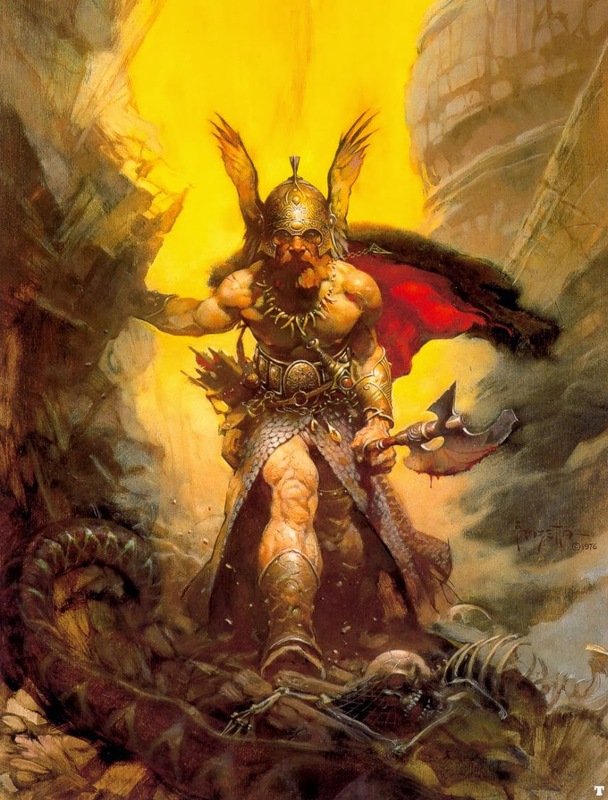 For all its success, I don't think the series ever developed quite the critical cachet of Moorcock's Eternal Champion cycle and definitely never achieved the cultural critical mass of Tolkien. In fact what's the fate of all these mid-level fantasy series of the past forty years? 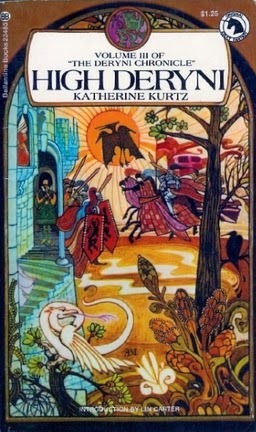 Will anyone hunt down Katherine Kurtz's Deryni books in twenty years? How about Raymond Feist? 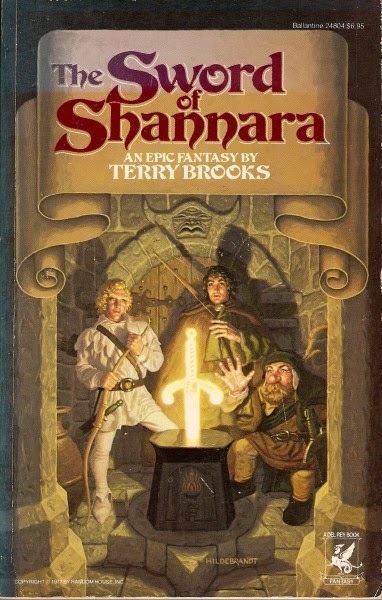 What about all the blatant Tolkien, and let's call them homages to be nice, books that sold well, like Terry Brook's Sword of Shannara or anything by Dennis L. McKiernan? Every year there's a new series started and of course that's what gets the attention. Let's admit to ourselves, most genre fiction, good as it is, is disposable. It's like pop music, rising up and reflective of its times, and then fading away from the larger public awareness. Most of the times it's like Foghat, fun but nothing special. The good stuff is like Deep Purple, and it's awesome. But if no one ever hears it again, things will go on. It's the same thing with fantasy fiction. We all find books that catch us in certain ways or at certain times. They might even become our favorites even though no one else has even heard of them. 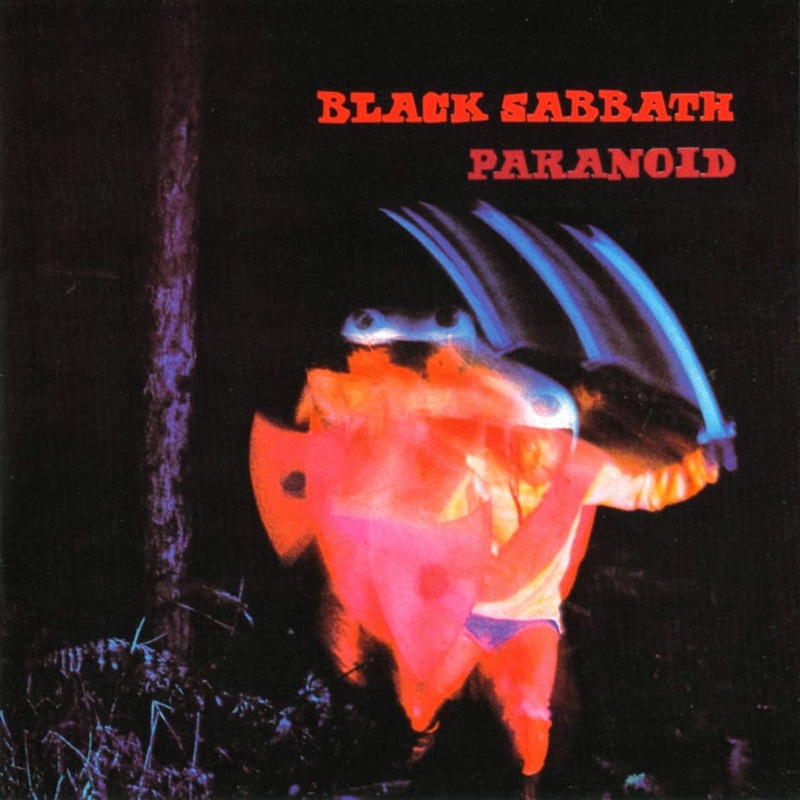 And for anyone keeping track, I did make a Yes playlist for this week's Black Gate post. 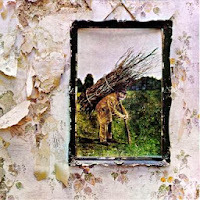 It leaned heavily on Relayer and Going for the One. I'm writing about the month's short stories next so I think I'll just put the Zune on shuffle. I'm easily distracted when I'm writing. Now that I have a deadline over at Black Gate that's a serious problem. Ill discipline is one of my greatest flaws at all times. Knowing that, I've stripped the games most obsessing me lately off my home computer. I'm also forcing myself onto a steady schedule. Read, write, let the luminous Mrs. V. proof/edit, then rewrite, repeat. So far so good. One problem is, I'm the sort of person who leaves the tv or radio on when I'm reading. I like some sort of background sensory stimulation. Too often I find silence more distracting than tv. One of the things I do when I write is make a playlist I and let it go. 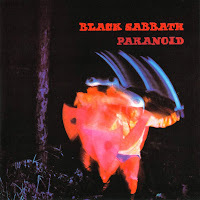 Which meant for this week's Night Winds article old school Sabbath and non-acoustic Zeppelin (except for "Gallows Pole" which really fit the mood). Seems sort of obvious now that it's done. Electric Funeral and When Levee Breaks were part of a perfect soundtrack for Wagner's stories. 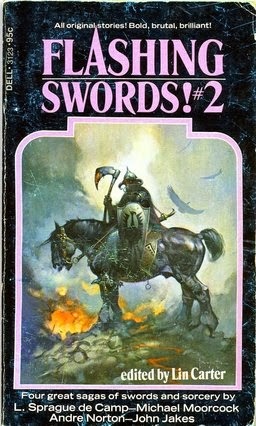 I'm not sure, but I'm thinking Yes for Andre Norton's Three Against the Witch World. And, yes, I know my choices betray my age. Sorry I'm so late reviewing this month's issue of Swords and Sorcery Magazine. It did come a little late but it's September now and this should have been up at least a week or two ago. Continuing to publish solid stories, both of the August issue (#19) are good. The first, "Fisherman and Old Cloot" is by DC Harrell. It opens as a folk-tale, complete with a once-upon-a-time setup with lines like "Those few who did dwell" and sounding as if being conveyed by spinner of stories. It quickly switches from twice-told-tale mode to standard third-person before returning to folk-tale mode. Old Cloot is a Nessie type monster living in the deepest parts of a lake surrounded by high peaks and cut off from much of the world. Like the fisherman of the title's sons, we learn the elaborate legend of Old Cloot from a cattleman. Containing a saint, a magic bridle, and a monster that changes shape into a horse, it wouldn't surprise me if it appeared in a collection of Scottish fairy tales. Dubious of the existence of Old Cloot, the fisherman comes face to face with the monster one morning. Contending with the monster's sudden appearance is only the beginning of the terrors the man must face. The result of his struggle against the beast is something completely unforeseen and devastating. Harrell avoid the pitfalls I've found common in such mock folk-tales. Too often they succumb to tweeness or are smothered by unaffecting pseudo-archaic language. "The Fisherman and Old Cloot" doesn't and I definitely wouldn't throw it back into the lake. Garnett Elliott's "Winter Exodus" is actually a swords & sorcery story. Young Gecerix leaves his father's royal chamber only to return to find his father overthrown and pinned to his throne with his own spear. The teenager, his mother and the few retainers who remain loyal to him are cast out into the cold night. With few supplies they face death at the hands of the cannibalistic Skrae or from exposure and starvation. Driven to seek sanctuary in a haunted tower, Gecerix finds himself tempted by a mysterious, dark figure. Called Eilu, the dark figure, with words and visions, weaves a tale of an ancient world warm and lush. Great cities and towers stood where only ruins now remain. If only Gecerix will do a certain service for it the dark figure will restore that world for the exiled prince and his followers. The young man's reactions are the heart of "Winter Exodus". It's a good story, though a found the end a little rushed. The sudden ending turns what could have been a great stand alone story into one that feels like the opening pages of a much longer story. Sometimes that works for me, but here it jarred the story a little too much. Instead of being great it only ended up be pretty good. So there's another month and another two stories by authors I've never read before. Based solely on these two stories I'd give both another go.